Vancouver, BC – Skyharbour Resources Ltd. (TSX-V: SYH) (OTCQB: SYHBF) (Frankfurt:SC1P) (the “Company”) is pleased to announce plans for its upcoming summer/fall 2018 diamond drill program to commence shortly and that it has now completed the 100% earn-in of its flagship, high grade Moore Uranium Project well ahead of schedule. In addition, 1,159,175 warrants have been exercised recently raising an additional CAD $449,884 in net proceeds for the Company. Skyharbour has received all of the required permits for its upcoming summer/fall diamond drilling program. This program is scheduled to commence shortly and will consist of a minimum of 3,000 metres of drilling in 8 to 10 holes. The bulk of this drilling will test the basement rocks within the high grade Maverick corridor well below the unconformity. 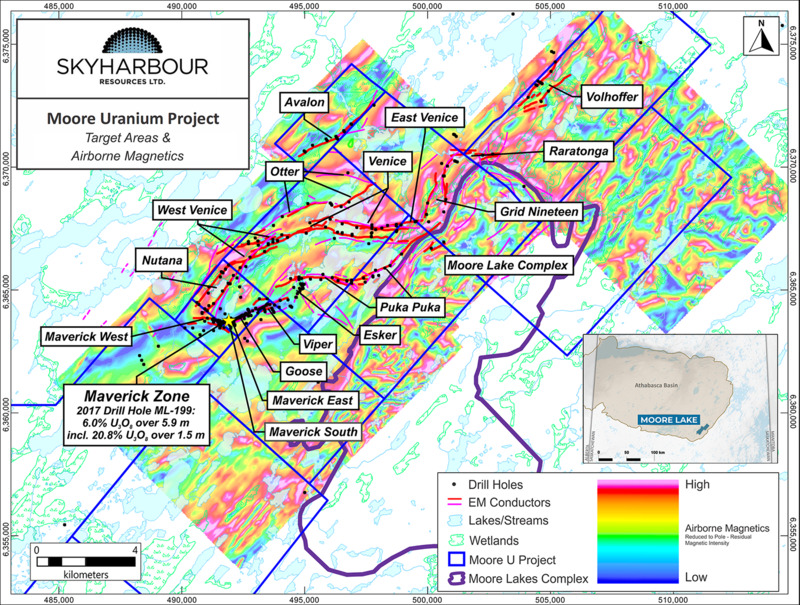 Skyharbour’s technical team has recently reinterpreted historical drill results and has identified high-priority drill targets within the basement rocks of the Maverick corridor below the drill-defined, high grade, unconformity-style uranium mineralization at the Main Maverick Zone. Prior drilling within the basement rocks, although of minimal extent, has intersected significant structural disruption and favourable alteration along with anomalous pathfinder elements and low grade uranium mineralization. These characteristics bode well for the discovery of basement-hosted feeder zones to the overlying high grade, unconformity-hosted uranium mineralization within the Maverick corridor. The Company announces that 1,159,175 million warrants have been exercised recently raising an additional $449,884 million in net proceeds. The majority of these warrants were set to expire last week and had an exercise price of $0.40. Skyharbour is fully funded for this upcoming 3,000 metre diamond drilling program at its Moore Uranium Project which has a budget of approx. $1 million. The Company is well financed with over $3.2 million in the treasury after making the $300,000 payment to complete the earn-in at Moore. Further to the news release dated July 14th, 2016, the Company announces that it has elected to pay the remaining CAD $300,000 cash option payment due to earn a 100% interest in the Moore Uranium Project from Denison Mines Corp. (TSX: DML) (NYSE MKT: DNN) (“Denison”), a large and strategic shareholder of Skyharbour. The Company has completed the 100% earn-in on the project almost three years ahead of the five year option term which included the issuance of shares, staged cash payments totaling $500,000, and $3,500,000 in exploration expenditures. Denison has also elected not to exercise its first buyback option, meaning that Skyharbour now owns 100% of the property. The Company now has an additional five year period to incur an additional $3,000,000 in exploration expenditures on the project (“Additional Expenditures”). At that point, Denison may elect to exercise a second buyback option to repurchase a 51% interest in the property by making a cash payment of $500,000 and spending $16,500,000 in exploration expenditures on the property over the following four year period. The parties would then form a joint venture with Denison owning 51% and Skyharbour owning 49%. If Denison fails to complete this second buyback option, Skyharbour would retain its 100% ownership in the property. If the Company does not complete the Additional Expenditures within the allotted five year period, Denison may elect to exercise a buyback option at any time to repurchase a 51% interest in the property by making a cash payment of $500,000 and spending at least 2.5 times the expenditures incurred by Skyharbour since the beginning of the Option Agreement. The parties would then form a joint venture. Skyharbour holds an extensive portfolio of uranium and thorium exploration projects in Canada’s Athabasca Basin and is well positioned to benefit from improving uranium market fundamentals with five drill-ready projects. 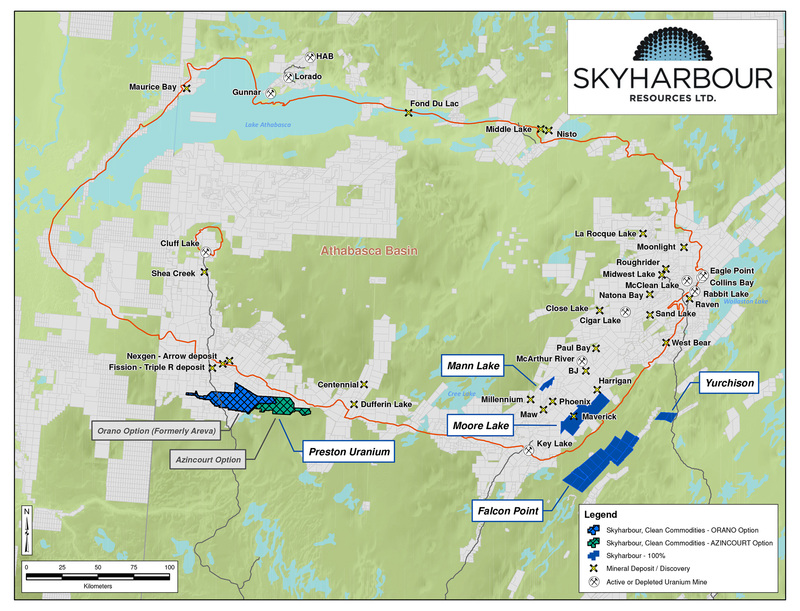 In July 2016, Skyharbour acquired an option from Denison Mines, a large strategic shareholder of the Company, to acquire 100% of the Moore Uranium Project which is located approx. 15 kilometres east of Denison’s Wheeler River project and 39 kilometres south of Cameco’s McArthur River uranium mine. Moore is an advanced stage uranium exploration property with high grade uranium mineralization at the Maverick Zone with drill results returning 6.0% U3O8 over 5.9 metres including 20.8% U3O8 over 1.5 metres at a vertical depth of 265 metres. Skyharbour has signed option agreements with Orano Canada Inc. and Azincourt Energy whereby Orano and Azincourt can earn in up to 70% on the Preston Project through a combined $9,800,000 in total exploration expenditures, as well as $1,700,000 in total cash payments and Azincourt shares. Preston is a large, geologically prospective property proximal to Fission Uranium’s Triple R deposit as well as NexGen Energy’s Arrow deposit. The Company also owns a 100% interest in the Falcon Point Uranium Project on the eastern perimeter of the Basin which contains an NI 43-101 inferred resource totaling 7.0 million pounds of U3O8 at 0.03% and 5.3 million pounds of ThO2 at 0.023%. The project also hosts a high-grade surface showing with up to 68% U3O8 in grab samples from a massive pitchblende vein, the source of which has yet to be discovered. 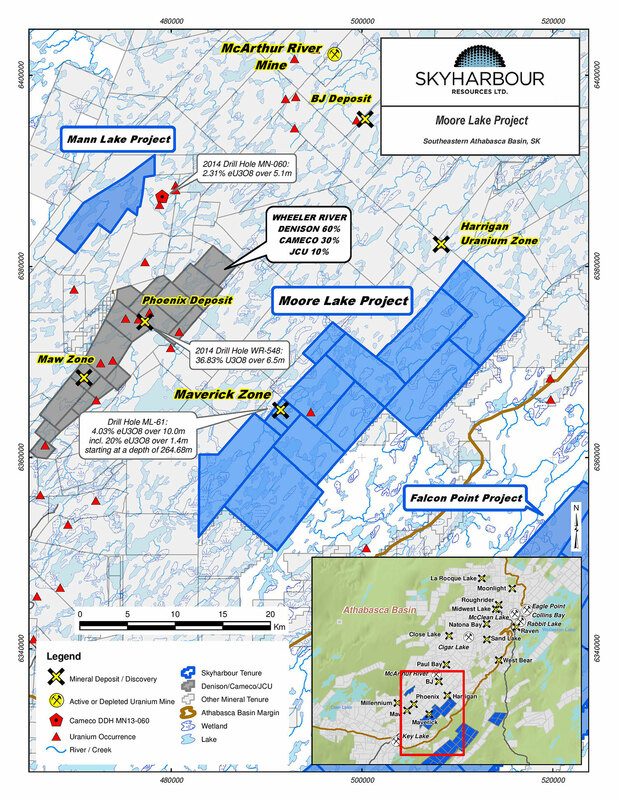 The Company’s 100% owned Mann Lake Uranium project on the east side of the Basin is strategically located adjacent to the Mann Lake Joint Venture operated by Cameco, where high-grade uranium mineralization was recently discovered. Skyharbour’s goal is to maximize shareholder value through new mineral discoveries, committed long-term partnerships, and the advancement of exploration projects in geopolitically favourable jurisdictions.